As a SAMPE member, we welcome you to take advantage of offers opportunities and services available only to SAMPE members. There are two types of memberships from which you can choose: professional or student. Meetings, seminars, publications, and technical papers are forums available for members to discover and access the most advanced materials and processes being developed by the scientific community. Local chapters provide organized gatherings, allowing you to meet others in your community. For many of its dedicated members, the most important aspect of SAMPE is the ability to help make new contacts, forge enduring associations, and promote lasting friendships, as well as significant career advancements. SAMPE offers strong employment assistance for members through its international network of contacts. If you are seeking employment or are looking for other career opportunities, our membership services adviser is there to help connect you with engineering managers and other decision makers looking to fill positions. Active members are encouraged to become an intemational officer and serve in SAMPE's international arena. This can provide you a rare opportunity to influence an entire industry. SAMPE is the only technical society disseminating military and NASA- sponsored information on advanced materials and processes to all industries. Annual awards are presented honoring distinguished contributions in material and process engineering, notable technological breakthroughs, and top technical papers. SAMPE provides the international stage for the recognition of your work through several media, including the SAMPE Journal. Introduce and promote your company's newly developed materials, process improvements, and products at regional and international gatherings. 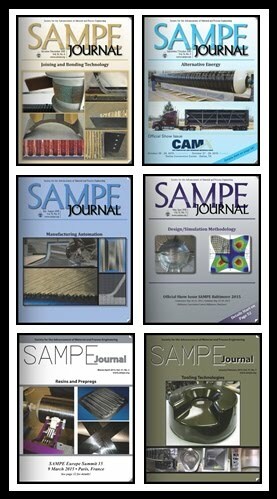 SAMPE Members receive the Online Technical Papers free of charge. Once a member registers with the SAMPE Website and logs in, he/she can choose as many Technical Papers as they want "Free of charge" from the SAMPE Store. This benefit alone is potentially worth tens of thousands of dollars as there are over 6,000 Technical Papers. Your complimentary subscription to this informative and acclaimed bi-monthly publication will provide you with a steady stream of technical articles, industry and international technical news, product and new literature announcements, book reviews, technical events calendars, and local SAMPE information. assures the participation of prominent industry speakers, extraordinary exhibits, and informal opportunities for peer contact.